Agrotechnomarket.com - A variety of farm machinery is available nowadays to make agriculture easy and more productive. One such very useful modern equipment is mowers. Used to cut grass with the variety of blade systems they have, they make the cutting and cleaning process very quick and neat. Let’s know more about them and how they are used to cut paddocks, fields and lawns. In addition, we will also know about their different variety available in the market. Read the discussion carefully and compare the numerous benefits offered by topper, finishing and flail mowers and conclude the best cutter for your job. 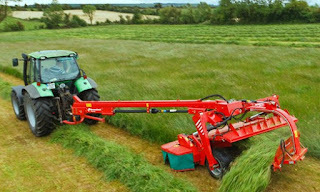 The blades, cutting applications and type of grass cut are clearly explained. Blades — These mowers have two blades attached to a blade carrier which rotates to enable the blades to top the grass. Cutting Applications — These are best suited for paddocks or areas with rough pasture. The topper tops the grass and slices through the materials like avoiding tangles and brambles. A closer cut can be achieved if the ground isn’t too rocky. Grass Cut — Here, the cuttings are longer than a finishing mower or flail. The grass is mostly stored against the skids of the machine which leaves behind rows of cuttings and not scattering. Depending on the usage and needs, you can buy the type of mowers best suited for your use. In case of any deformity or complication, a variety of flail mower parts are available in the market, both offline and online. 0 Response to "Types and the Uses of Movers in Modern Agriculture"